Product: Classroom Computer Table - Correll Work Station RWS3060 Desk. Color goes all the way through the plastic, so it will not wear or scratch off. Competitive Edge Products, Inc. is an authorized retailer ofCorrell products. Do you need the table top to be adjustable? Please view our Adjustable leg table products. 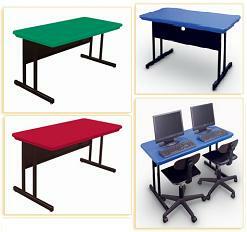 Another great school table option we carry is our folding card tables. Q: how many can these seat? A: Can hold four adults comfortably or six children. Shipping on In Stock Items: Orders for the Correll RWS3060 generally leave the warehouse within 1-2 business days. Delivery Details: This product ships directly from the warehouse in Charleston, AR. This item generally ships via FedEx and may not require a signature. Dimensions: 60" x 30" x 3"